The DIV-Net: Are Walmart Figures So Bad That You Need To Sell The Stock? Are Walmart Figures So Bad That You Need To Sell The Stock? As a long-term investor in Walmart, I have seen many ups and downs of the stock in recent years. Today's sell-off will not change my attitude in this great company. The reason why I'm long in Walmart is its deep value and roots to the US economy. Remember, Walmart has over USD 485 billion in annual sales. The next biggest competitor (Costco Wholesale) generated sales of USD 129 billion and Amazon USD 177 billion. Walmart is a Dividend Champion with solid growing financials and 44 years of consecutive rising dividends. The current hike is very small, only 2% and may reflect the increasing pressure from decreasing earnings. For sure, Walmart doesn't grow at a high rate and got pressure from online retailers like Amazon, but it doesn't mean that they will be killed by them. And Wal-Mart still has room to grow dividends or run them flat until they have developed their own online sales tool to boost earnings. 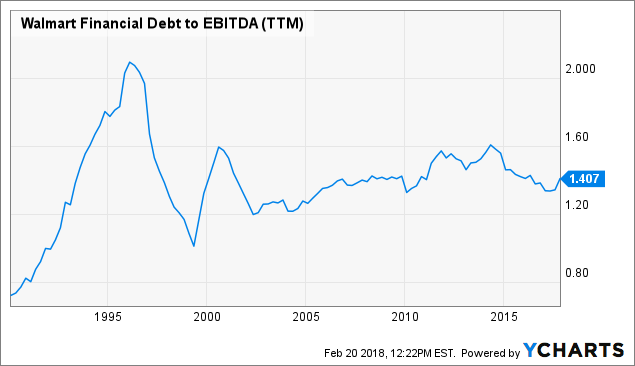 A Look at the debt in relation to Walmart's EBITDA gives us a feeling of the financial stability. The ratio is often used to evaluate the leverage of a company. The figure amounted to 1.4 for Walmart; a very solid number. Walmart's management released a fiscal year 2019 EPS guidance between $4.75 and $5 per share. Analysts estimated a slightly lower value. The consensus estimate was $5.13. A main trigger for today's sell-off was the drop in online sales. The company reported e-commerce sales of 23%, compared to 50% in Q3 and 29% a year earlier. But its growth should come back to 40% this year. Comparable sales could develop into bigger problems for an inflexible business model with high fix costs. If you have a big cost basis and your customer traffic slows; your earnings are in free fall. Comparable sales for Q4 grew by 2.6%. Not bad in my view, especially when you consider that this was the 14th consecutive increase in the US market. So, what's the reason for the deep sell-off today? - The expansion into e-commerce cost money and creates losses. I guess, the recent stock price increase from around 70 bucks to around USD 100 in 2017 (new all-time highs), was driven by hopes that Walmart has a concept against Amazon and could develop its own business into a fast growing multi-channel-retail machine. Those hopes got trashed with the Q4 report. But does it mean that Walmart could not develop a wonderful online retail business over the next years? Definitly not! The current sell-off is hard for an investor, especially when you bought the stock over USD 100. 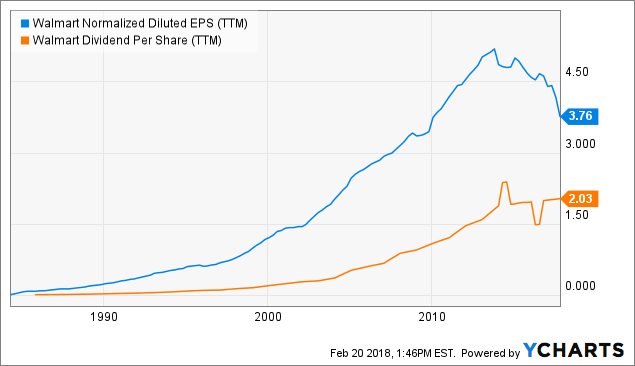 An EPS in 2019 of 5 dollar would mean that your initial investment has a P/E of 20. 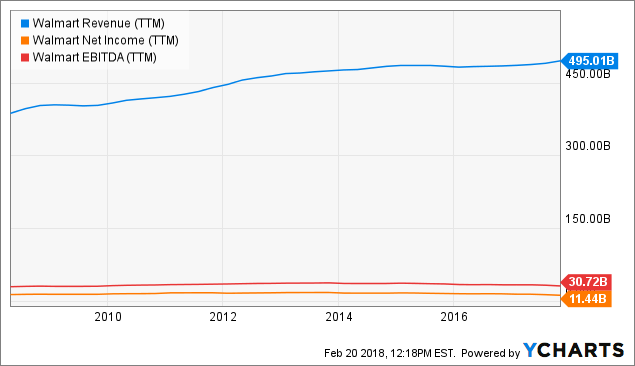 For a slow growing stock like Walmart, who increased sales over the past 10 years by roughly 30%, is this ratio too high, especially when you consider that earnings run flat. The capital market participants are very short-term orientated and focused on popular investment themes. For the retail industry means this: Go long online and short offline. The big money is betting that online will kill offline retail. I don't think that this will happen. I believe the future is a mix of both, a kind of multi-channel. Amazon bought Whole Foods as a result of this idea. Without physical stores, you will not be a future player in retail. Today's figures showing not a big growth but they are not as bad as the sell-off suggests. 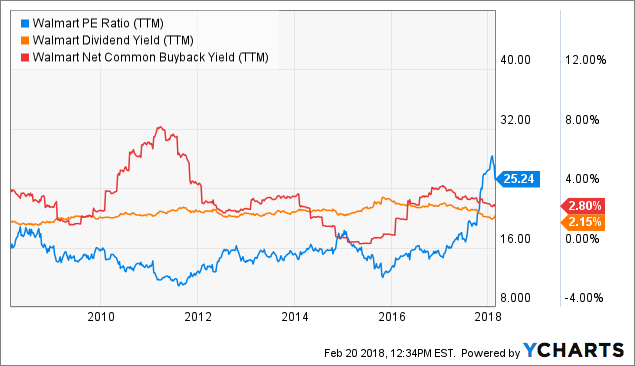 If investors think the valuation is too high, they should take a few chips off the table but Walmart is still a solid pick in the retail industry with a nice buyback and dividend yield close to 5% combined.